SST32 5.68cts t.w. 11.7mm rose blossoms Brazil $200. Beautiful workmanship, nice carving and nice polish, transparent orange- red gem tourmaline, eye clean. Great earring pair. Beautiful workmanship, nice carving and polish, transparent golden orange gem topaz, eye clean. SST33 3.24cts t.w. 10.2 x 9.5mm seashells Brazil $100. 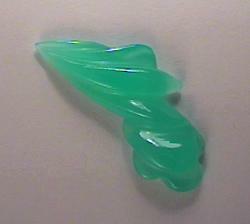 Very nice workmanship with a great polish, transparent very dark blue-green gem tourmaline. Great earring pair! Beautiful slice of gem tourmaline with a series of geometric growth tubes and patterns, polished on all sides and girdle.